A sector is simply a unit of information stored on your hard disk. Rather than being a soupy mass of fluid information, your hard disk stores things neatly into "sectors". The standard sector size is 512 bytes. There are two types of bad sectors – hard and soft. Hard bad sectors are the ones that are physically damaged (that can happen because of a head crash), or in a fixed magnetic state. If your computer is bumped while the hard disk is writing data, is exposed to extreme heat, or simply has a faulty mechanical part that is allowing the head to contact the disk surface, a "hard bad sector" might be created. Hard bad sectors cannot be repaired, but they can be prevented. 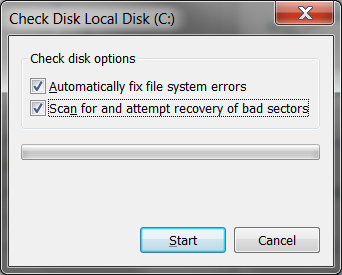 Windows has inbuilt check disk tool, called "Chkdsk". It is recommended to run this tool from time to time. It will scan the disk for errors, fix logical errors, detect and mark bad sectors, so that Windows will no longer try to use them. This way it can prevent your computer from becoming unstable. There is a slight disadvantage, though – Check Disk may require a lot of time to perform its task. It depends on many things, like overall PC speed, number of files and folders on the disk, amount of RAM, and disk size. So it's best to run Check Disk only if you don't need to use the computer for some time. Also Windows Chkdsk wants exclusive access to the computer. In most cases it will ask for a reboot and will run right after the reboot, so you won't have access to your PC. Of course, you can always interrupt the process, but it's not a good idea. You can help prevent bad sectors (always better than trying to repair them!) by paying attention to both the hardware and the software on your computer. Always shut down your computer correctly - use an uninterrupted power supply if your house is prone to blackouts. Run a quality anti-virus and anti-malware software and keep the programs updated. Are you running out of ideas on how to speed up your computer? Read our next article to learn more about slow computer optimization and tricks that make computer run faster and smoother.